It is a perfect route for those who want to experience the main sights of Chapada dos Guimares in the twinkling of an eye, but in a comprehensive and detailed way … in cosy and luxurious accommodations. Stages: Cuiabà Airport; Chapada dos Guimaraes; Portao do Inferno; Mirante; Veu de Noiva. Conditions: The cost of the Tour in Chapada dos Guimares includes transfer to/from Cuiabà airport or town, all transfers mentioned, stay in pousada/hotel by half board, daily excursions with a bilingual guide. Departure from Cuiabà Airport to reach the wonderful red stone canyon plunged into luxuriant and green forest of Chapada dos Guimaraes. The village of Chapada dos Guimaraes is about 60 km away from Cuiabà and you can quickly access it through a smooth road. On the way we will take some stops to appreciate the surrounding landscape and some of the most relevant touristic places, more specifically the Portao do Inferno (The Door of Hell). When arrived in Chapada Village and left your luggage in the hotel Pousada, we’ll take a short city sightseeing and we’ll arrive as far as Mirante, a sensational panoramic spot as well as the South American geodetic center. Then overnight stay in hotel. 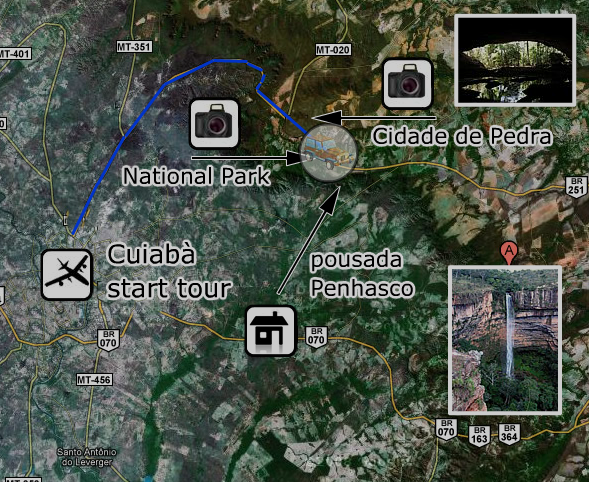 In the morning an ecological walk in the pousada is planned, where we’ll see various and curious rock formations (e.g. “sewing machine”), and prehistoric rupestrian inscriptions. Lunch, then visit of the impressive 86-metre waterfall, known as Veu de Noiva (bride veil). Return to Cuiabà Airport.